The conclusion I’ve now come to is that the next step a person needs to take in their personal journey is unique to them. Maybe I don’t need what some knowing-seeming person seems to be talking about. Doesn’t mean what others have to say is wrong. It could be right. Wrong could also be mixed in with the right. If you just take what people have to say at face value, you get the wrong and the right. And heck, even if what they say IS totally true, who knows if they can communicate it effectively? So I now realized that my own path is one step at a time – and that the way I take those steps may be completely different from anyone else. And, truth is, I might come to a completely different conclusion tomorrow. What I’m writing here, however, solved my feelings of frustration and uneasiness that I felt today. Maybe I’m wrong in some aspect of it, but I can be at peace with knowing I’ll find out when that falsehood becomes an issue. I can trust my sense of what’s true to guide me in the right direction when the time is right. Quietly, by yourself, think of the issue. Remember how it makes you feel. What are you uncertain of, which others seem so certain about? Why are you uncertain of this? What is the truth of your feelings? After reacquainting yourself with your feelings, remember that these are your feelings. No one else knows your feelings, and at any time they might not consider them, not notice them, or not want to deal with them. Right? Now, knowing your feelings, what is the right thing to do? Does something still bother you about the situation? Why? Hope that helps! Remember, everything I say are just ideas to try out. Stay connected to what feels true to you, and you’ll find your way. At least, that’s what I think now! 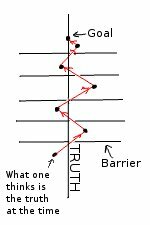 Here’s a little picture I drew, demonstrating the idea that people can break through barriers without knowing the WHOLE truth. As you break through more barriers, you learn more about what’s true. Anyone can overshoot the Truth when breaking through barriers towards a goal. But hey, it works! This entry was posted in Insights and tagged finding your own path, frustration, jealousy, own path, peace, self-doubt, trust, truth, uncertainty by Oliver Kaufman. Bookmark the permalink.